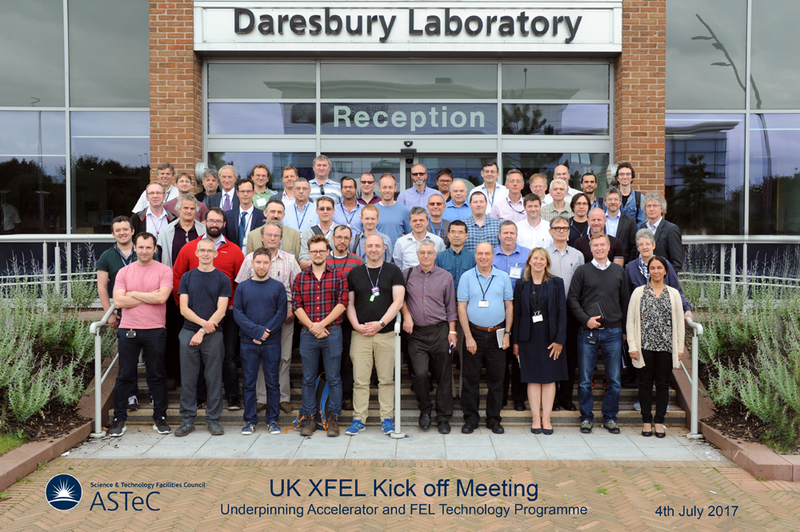 More than 60 members of the UK accelerator community gathered at Daresbury Laboratory on 4th July 2017 to officially launch the UK XFEL Underpinning Accelerator and FEL Technology Programme. Members of ASTeC, Cockcroft Institute, Diamond Light Source and John Adams Institute have generated the programme in response to the STFC 2016 FEL Strategic Review. The programme will run for four years and will address the key technical accelerator challenges for the proposed UK XFEL in order to prepare the way for making all of the major technical decisions once the full facility specification is defined by the user community. Jim Clarke (ASTeC), the programme leader, opened the meeting by welcoming the attendees, explaining the purpose of the event, and providing an update on the current status of CLARA, the new FEL Test Facility which sits firmly at the heart of the complete programme. The meeting then heard from each of the eight work package leaders who explained what challenges their work package would be addressing and how they were planning to tackle each one. Many of the speakers highlighted how experimental results from CLARA are already starting to answer some of these fundamental questions. The selected challenges cover a diverse range of areas, all of which are crucial to any future UK XFEL. The work packages cover the electron source, the RF system, the electron beam transport optimisation, FEL performance enhancements, beam instrumentation, femtosecond synchronisation, and novel undulators. The meeting ended with a provocative talk from Andrei Seryi (JAI) who proposed that CLARA should rapidly evolve into an industrial and science user facility taking advantage of the Industrial Strategy Challenge Funds. This would require the beam energy to be increased significantly and the faciity to extend by about 100m under the car park!